Concession: wrestling, by most traditional measures, is not cool. That point gets reinforced with surprising frequency. Did you know that someone ran a successful Senate campaign on the platform of “Hey, at least I don’t own the world’s largest professional wrestling company”? Did you know that The Rock went out of his way to abandon his wrestling persona during the first five years of his movie career, to the point that he insisted on going by Dwayne Johnson? The U.S. Senate. The star of “The Tooth Fairy“. Both too cool to be associated with professional wrestling. It’s been this way for almost all of modern history, with a couple notable exceptions. The first is the mid-1980s “Rock ‘n Wrestling” era, which included some crazy collaborations and record ratings for NBC. I wasn’t around for that one. The second, and most recent, is the “Monday Night Wars/Attitude Era” of the late 1990s, led by Stone Cold Steve Austin. For a brief moment, wrestling was cool. Full disclosure: it still wasn’t cool to be a 15 year old wrestling fan with braces in coastal Orange County. But I heard tales. Austin ruled the wrestling world and was at least middle class in pop culture until he flamed out in 2002. The story, re-told by Austin himself on numerous occasions, is that Vince McMahon told him that he would lose to Brock Lesnar (then a rookie) on free television with no promotional build-up. Austin thought that was a stupid idea (he was right) and quit. WWE and Austin reunited for a very brief run in 2003, then Austin retired due to a neck injury and hasn’t wrestled since. With that (and some other stuff relating to the consolidation of the wrestling business), wrestling faded from pop culture. There have been a couple blips on the public radar, though the most notable is sadly that time when Chris Benoit murdered his family and the WWE aired a tribute show to him while the victims’ cause of death was still uncertain. Nancy Grace got a couple weeks of programming out of it, so I guess there’s that? Since then, the closest thing to cool in wrestling has been Brock Lesnar, NCAA heavyweight wrestling champion, UFC heavyweight champion and the first human ever to turn completely purple due to physical exertion. Brock has elite athletic ability, preposterous size and mild psychopathy. He is the perfect wrestling villain. 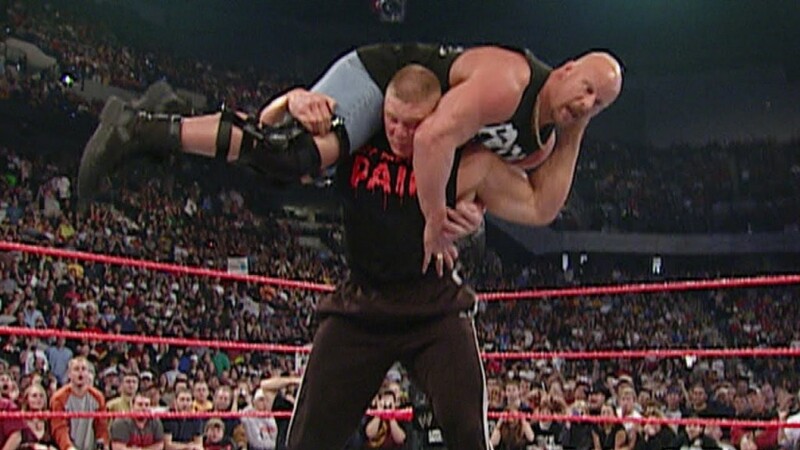 Since his return to WWE in 2012, Lesnar has ended the Undertaker’s Wrestlemania Streak, destroyed John Cena and established himself as the most dominant wrestler since, well, Stone Cold Steve Austin. Austin has said on numerous occasions that he would only wrestle again in the perfect set of circumstances. Well, the guy who indirectly drove him out of wrestling evolved into the greatest wrestling villain of the modern era, and WWE happens to have rented out Cowboy Stadium in Austin’s home state of Texas for Wrestlemania next year. That’s pretty damn close to perfect. Last night on the WWE Network “Stone Cold Podcast”, Austin interviewed Paul Heyman, Brock Lesnar’s advocate. After 58 minutes of pleasantries, Heyman asked Austin whether he would like to fight Brock Lesnar at Wrestlemania 32. 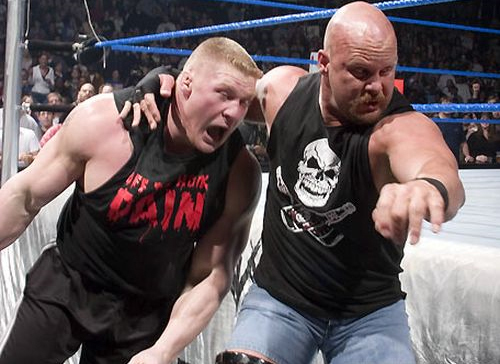 Austin immediately shifted into the Stone Cold character and spent the final two minutes of the show not accepting the match but making it very clear that if he were to accept the match he would murder Brock Lesnar. I got so excited that I forgot that I don’t have braces anymore. WWE doesn’t do subtle. This is happening. To my fellow nerds, it’s time to repent. If you complained about Daniel Bryan not beating Lesnar in the main event of Wrestlemania 31, you’re officially wrong. So, so wrong. When you’re clearing you browser history this week, maybe go through your Twitter feed and sweep out all those complaints. Please, leave the angry YouTube videos. I love angry wrestling fan YouTube videos almost as much as I love the thought of Lesnar-Austin. To everyone else, get ready to have at least mild interest in a wrestling event in Spring 2016. Wrestling is back. This entry was posted on Tuesday, June 2nd, 2015 at 12:48 pm	and is filed under Events, News, Television. You can follow any responses to this entry through the RSS 2.0 feed. You can skip to the end and leave a response. Pinging is currently not allowed. « Eddie Redmayne Is Doing What In The World of Harry Potter?! ?